On a style note, I am adoring these high waisted shorts from August Wrinkle! I have always wanted a pair of higher waisted shorts that I could pair with tights and boots for fall/winter and these are the PERFECT pair. I love how they fit and adore the cream and brown checkered print. They are going to be extremely easy to style, as they look good with just about any top, whether dressing them up or down. I felt very fall appropriate in this outfit, especially because of my chunky sweater and cozy cowl! PS August Wrinkle is currently having a moving sale! Use the code ALOHAHAWAII to get %25 of your purchase. Valid until November 7th!! I love the color the orchard leaves turn in the fall and the blanket of leaves on the ground! So pretty. You outfit is always beautiful, I love the sweater and the shorts. Btw, where do you live?? Wow love this outfit! very beautiful!!! Amazing !! !Love this outfit..and the pictures are so beautiful!! These photos are so awesome!! I loove this look for fall, the shorts are gorgeous. That sweater looks so cozy especially with the leather jacket! Great autumn look. LOVING those boots. Great look, the pics are beautiful! Your photos turned out fabulous! I love the shorts, tights and boots look, but haven't found cute shorts like yours yet. I love these layers and these shots in the orchard are soo pretty! I'm a huge fan of tights with shorts and you completely nailed it! I always think of myself as a summer girl too, but fall has some wonderful style options to offer that I can just not get enough of lately! Great Fall look. 🙂 Love the top and ring ! x Have a relaxing weekend. I've been looking for someone who had ordered from SheInside. How is their quality and everything? I'm thinking about ordering some stuff but I am always apprehensive with new places! This is just the perfect fall outfit. You look SO cute. I love every single thing you're wearing, especially those boots! LOVE your boots & leather jacket! I'm wearing my faux-leather jacket from F21 on today's blog post, too! 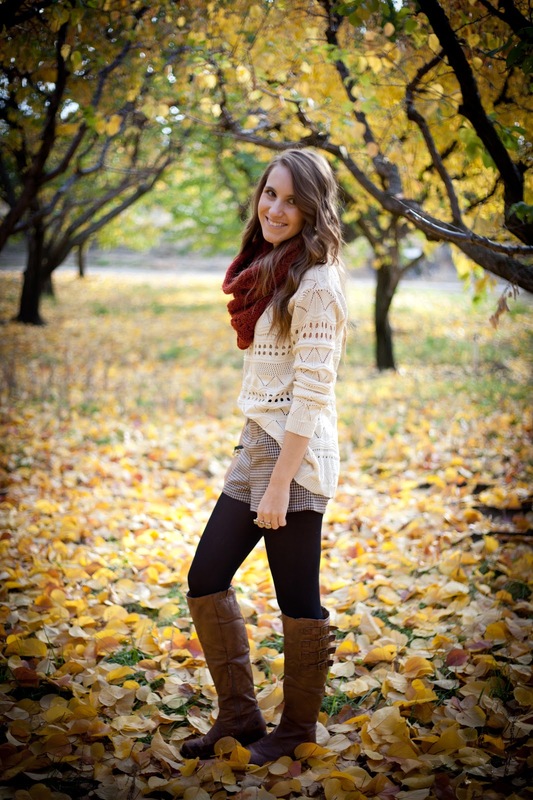 This is the perfect fall outfit! Wow, I love everything about this outfit! You look gorgeous! The sweater is my favourite part! I am so excited I found this blog, I love it and I love everything about your style! Now following! Such a cute outfit! I really love those shorts! I love everything about this outfit! I normally am not big on shorts in winter but love these. Love the shorts and overall color scheme. You blend in well with fall! I absolutely LOVE this outfit! 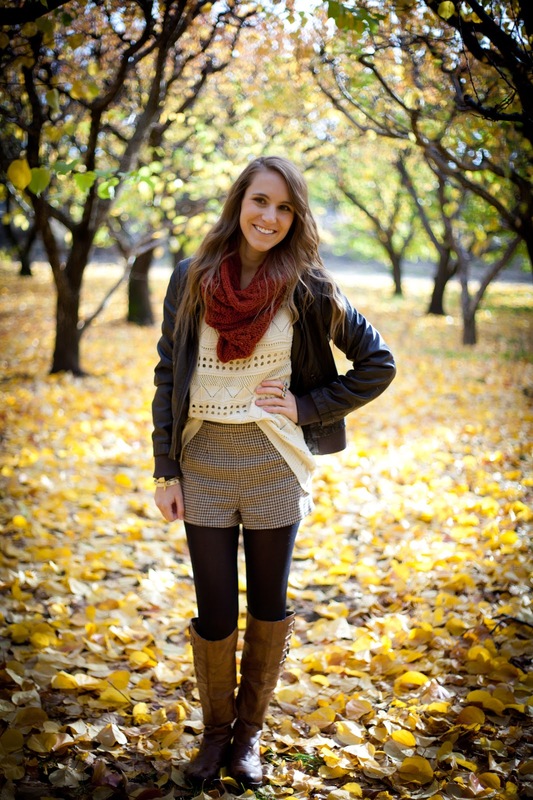 I think shorts with tights is such a cute look, especially paired with chunky knits in fall. I want to steal this whole look! Lovely outfit! The sweater is perfect! 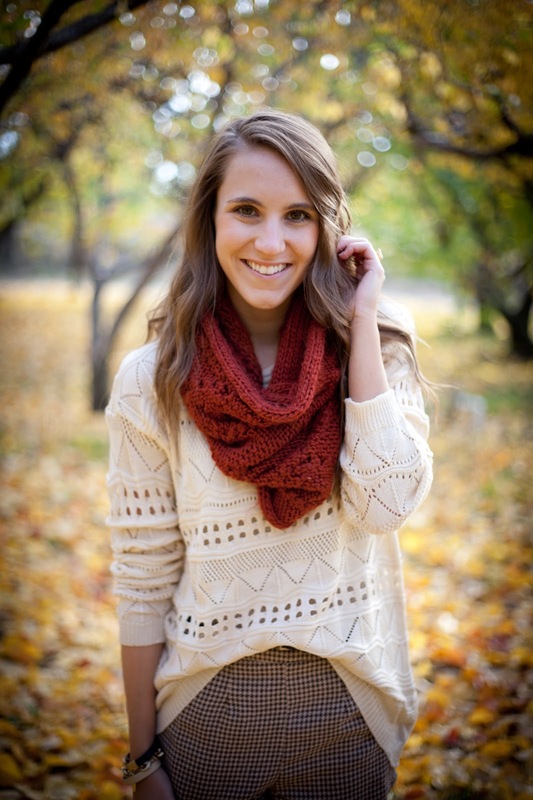 This is such a great fall look – I love everything! Thanks for visiting & following our blog. We love your blog & we just followed you back! You look phenomenal! I love everything about this look…especially the boots! oh wow what a great look! these boots are made for walking and i love your shorts! of course i want to follow each other darling, so i´m already your newest reader! i am soo loving the shorts, tights and boots look!! love love love it! can if i recreate it can i look as cute as you? probably not! I'm loving all the knits here. I definitely need more knit sweaters/scarfs to keep cozy & warm this winter. I'm in love with your sweater ans scarf!! 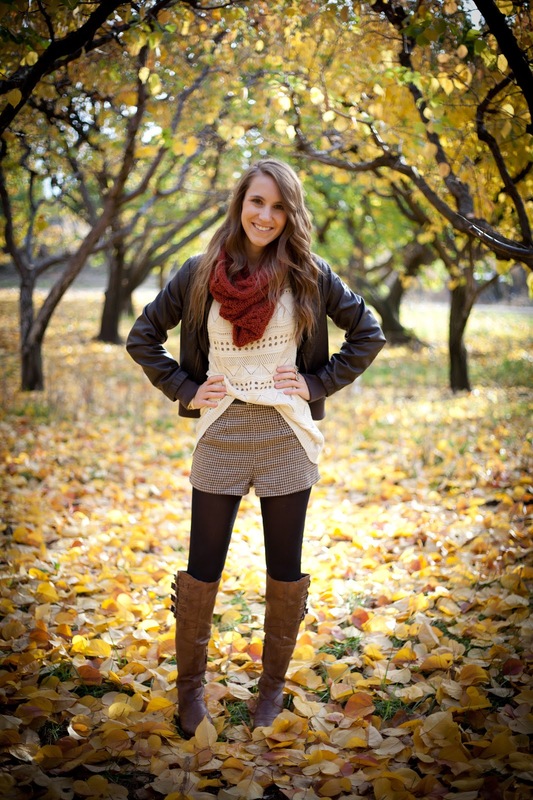 this is such a perfect outfit for fall <3 i love love love it! your posts always give me so much inspiration when it comes to outfits! Oops, my previous comment was in Dutch. But I just wanted to say that your outfit is gorgeous! And the location looks beautiful. Very nice. oh wow how gorgeous! Everything from the outfit and the photography – perfect!! I think this might be my favorite post of yours! The photos are stunning and I'm in love with the sweater and shorts. A perfect look from head to toe!